I believe that everything that a person or company delivers to another should reflect their image, style, nature, professionalism and character. 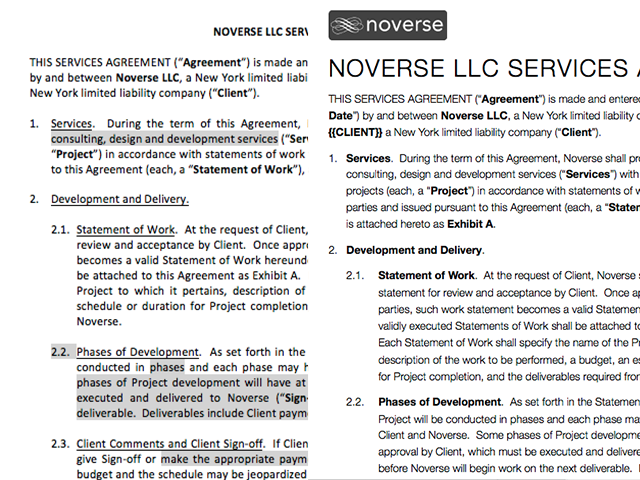 Which is why the look of the Noverse Professional Services Agreement drove me mad. Don’t get me wrong. My attorney and his team are absolutely brilliant. The contract content is the best, it’s well written, well balanced, contains all the right terms and conditions for both sides, and my clients are all very happy to sign it as is. Between the content of the agreement and the great advice, the legal side of my business is well taken care of. It’s just, well, the document looks boring, the same as every other contract I ever did see. It does not reflect the image of me or my company like all my other deliverables do. It’s a product of lawyers doing what they are good at, writing great contracts. They don’t use paragraph styles, they do use the default font from MS Word, the indentation is erratic, the numbering scheme varies (I guess they copy and paste terms from other agreements), spacing is off and, well, the document is not very appealing to read. Yet it’s a very good contract. So, I reformatted it. Kept the same content, of course, just applied my company’s standardized set of font and paragraph styles to the text, replaced the manual numbering scheme with an auto- generated one and got rid of all the underlines and shading. It’s the same document, but it now looks like a Noverse document, it looks like my contract, reflecting my attention to detail and style. And it stands out from all other contracts because of it. And yes, I checked, unless you are filing a document with certain courts, there is no requirement to use bad fonts or skip using paragraph styles. Consider, next time you send an email or a document, once the valuable content has been finalized, does the item reflect well upon you? Are you proud of both the content and the style? Would someone else who sees it be pleased to look at it and encouraged to consume the content? You make your business cards look good, you should do the same for all other deliverables, even contracts.